7-Year-Old With Bad Case Of Hiccups Powers Through National Anthem In Hysterical Video! 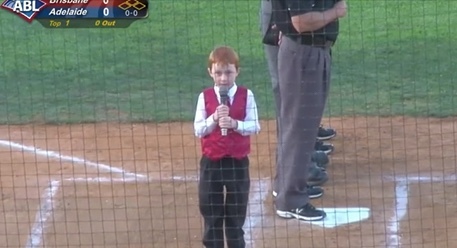 Imagine getting the opportunity to sing the national anthem at a local baseball game. Well, if you’re a good singer, you’d probably feel honored and excited about it. But sometimes, our nerves can get the best of any performer. As we all know, the national anthem isn’t the easiest song. There are notes that are extremely hard to sing and for most of us, we try our best to get something out that vaguely sounds like singing. A 7-year-old named Ethan Hall was going to be singing the national anthem at an Australian Baseball Game. The night prior to the game, Ethan had a case of the hiccups. Thankfully, they went away — or, so he’d hoped. As the 7-year-old begins to sing the Australian national anthem, he seems a little nervous, but he continues. Soon, however, a hiccup came out. Oh, no. Were the hiccups coming back? It wasn’t long until another hiccup escapes, then another! Ethan wasn’t going to let this hilarious case of hiccups ruin his performance of the national anthem, though! He just keeps powering through and keeps powering through. It’s quite admirable and you don’t want to miss it. Continue to the next page to watch Ethan’s adorably hilarious performance. Way to go, little guy!